Remember how much I loved Marilynne Robinson’s novel Gilead? 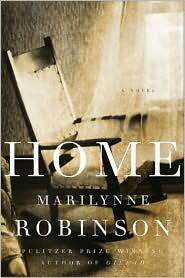 Home is not exactly the sequel, but the companion volume to Gilead, brandly-newly released. And, if possible, I love it more than Gilead. The story of Home occurs concurrently with the story of Gilead, among the same characters but told from a different point of view that reveals so much more. The Reverend John Ames, the central character and narrator of Gilead, is a peripheral character in Home, which takes place in the house of his lifelong friend Reverend Robert Boughton. (The two men are aging ministers, Congregationalist and Presbyterian respectively, in the fictional town of Gilead, Iowa in the 1950s). As in Gilead, Rev. Boughton’s prodigal son — the one wayward boy among his eight children — Jack Boughton, has come home after twenty years’ absence, and his homecoming unearths old ghosts and raises difficult questions, not least for Jack himself. Jack Boughton is an utterly compelling character, the kind of man I have tried to write about at least twice but have never gotten close to capturing with such brilliance, warmth and sadness. He is, in many ways, the main character, but the point of view is that of Glory, another character I found very easy to care about, Jack’s younger sister who has come home, in middle age, to live with her dying father after her own respectable and virtuous life has left her broken and disappointed. The bond that’s forged between Jack and Glory, and the relationship both of them have with their dying father — a genuinely good Christian man whose lifelong faith is challenged by the return of the son he has always loved, always feared for, and always forgiven — is depicted with such utter candour and perceptiveness it’s breathtaking. 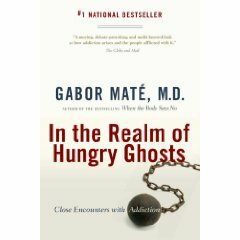 In the Realm of Hungry Ghosts is a wide-ranging look at the topic of addiction from a doctor who has had plenty of opportunity to study it. Gabor Mate works at a clinic in Vancouver’s notorious Downtown East Side district, an area rife with homelessness and hard drug abuse. In this book Mate explores addiction through his encounters with his desperate, addicted, but strangely courageous and grace-filled patients — as well as exploring the shadow addiction casts on his own respectable middle-class life. Mate is careful not to equate his own “socially acceptable” addictions and compulsions with his patients’ drug abuse in terms of the impact on his life and the lives of those around him, but he argues that all addictive behaviors — from his patients’ suicidal abuse of heroin and crack to his own compulsive shopping and spending — are only points on a continuum. Addictive behaviors, he suggests, may have many causes, but all are ultimately driven by our unwillingness as a society to allow ourselves (and each other) to really feel and experience pain, frustration, fear, and all the negative emotions that are part of being human. In a culture in which so much effort and energy is expended on entertaining ways to distract people from feeling human, should we be so surprised that many people — usually those with the deepest wounds from childhood — choose the chemical shortcut to avoid those emotions, and become trapped there?